NEW YORK (CNS) — Jesuit Father Joseph Parkes, president of Cristo Rey New York High School, is the 2017 recipient of Catholic Extension’s Spirit of Francis Award. Now in its fourth year, the Spirit of Francis Award recognizes an individual or group for their commitment “to reach out to the margins of society” in the spirit of St. Francis of Assisi, Pope Francis and the founder of Catholic Extension, Father Francis Clement Kelley. 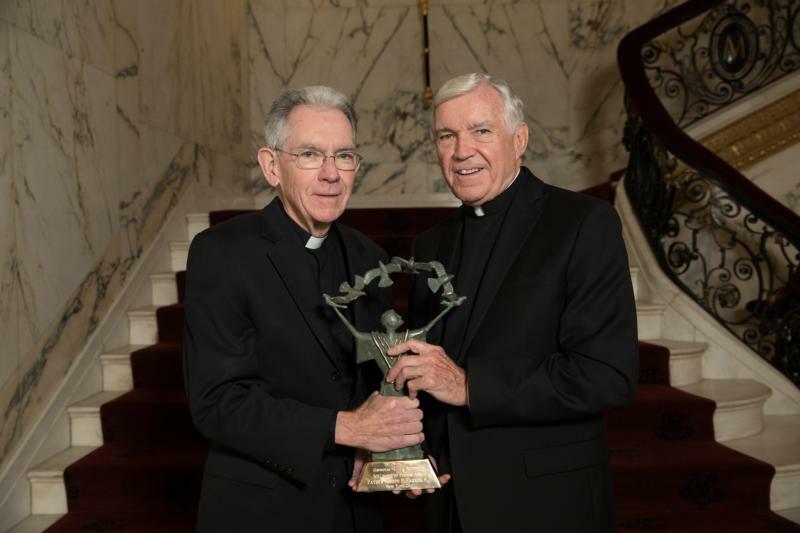 The priest was honored for his lifelong work as an educator and for his commitment to nurturing and guiding students who have demonstrated the potential and motivation to achieve success, but do not have the educational background or financial means to attend a private, college prep school. The award was presented during the annual Spirit of Francis Award Dinner held in early October at the Metropolitan Club of New York City. A Catholic Extension news release said that Father Parkes is guided by the spirit of care for the individual — the Jesuit characteristic of “cura personalis” — in challenging all of his students with a rigorous academic curriculum and a demanding work-internship program. “His ultimate goal is that all of his students graduate from college and become professionals for others, transforming the world for the good of their families, faith and society,” the release said. The Cristo Rey school model allows students to pay for most of their education by working five days a month in school-sponsored corporate internships that give the students work experience. “For the past 13 years, Father Parkes has led a very special expression of the great tradition of Jesuit education to reach out to the poorest of the poor,” said Father Jack Wall, president of Catholic Extension. “Father Parkes has helped kids who have never had the opportunity for a college education and, through the gift of the Cristo Rey network of schools, they become a spark of life and bright light to others,” he said in a statement. The first Cristo Rey High School was started in 1996 in Chicago’s low-income, predominantly Latino neighborhood of Pilsen. Now with 32 schools throughout the United States and more than 11,000 students, Cristo Rey is America’s largest school network exclusively serving the economically disadvantaged. The school boasts a high graduation rate, with more than 90 percent of the students going on to college and significantly contributing to their communities. Proceeds from the 2017 award dinner will fund graduate scholarships for Catholic Extension’s Young Adult Leadership Initiative at Jesuit-run Fordham University in New York. The program’s purpose is to help mission dioceses retain, educate and develop outstanding young adult leaders. A recipient of one of those graduate scholarships spoke at the dinner — Nathan Stell of the Diocese of El Paso, Texas. While completing his graduate work, he was recently hired as a full-time youth minister at a church near his hometown of Socorro, Texas, located on the north bank of the Rio Grande on the U.S.-Mexico border. The rural community has a population of around 30,000, of which 44 percent of those under the age of 18 are below the poverty line. “For the first time in my life, I go to work excited to see what God can do through me and through the team we have built and that we’re building,” said Stell. Loretta Brennan Glucksman and best-selling author Mary Higgins Clark, who is a former Spirit of Francis Award recipient, were the honorary co-chairs for the dinner. Elizabeth Marren and John and Susan Pettenati were the dinner co-chairs.